Portrait of Peri from Fire Emblem Fates. A Nohrian noble and one of Xander's retainers. A childlike, amoral killer. Peri (Japanese: ピエリ Pieri) is a character in Fire Emblem Fates. She is a cavalier working under Xander. Peri is paired up with Laslow. Peri is one of the characters available to be summoned by players from the game's initial launch. Only one variation of Peri is currently available in Heroes, based on her Fates incarnation. After Xander was crowned, Peri was put in charge of Nohr's army. Her cruelty faded as she grew into a strong commander, but she never lost her childlike demeanor, even on the battlefield. Corrin was hailed as a hero, working alongside his spouse to spread peace worldwide. Peri eventually learned the difference between right and wrong. It took a while. The two spent the rest of their lives together, Corrin ruling as the wise King of Valla. Peri eventually learned the difference between right and wrong. It took a while. Jakob served as a butler for the rest of his life, but his true love was reserved for his wife alone. Peri eventually learned the difference between right and wrong. It took a while. While no official records of Kaze survive, he appears in many rumors and tales of heroic exploits. Peri eventually learned the difference between right and wrong. It took a while. Silas served loyally as a knight of Nohr. He was beloved by trainee knights for his great patience. Peri eventually learned the difference between right and wrong. It took a while. Despite marriage, Kaden continued to travel, returning favors. Later he served as chief of his village. Peri eventually learned the difference between right and wrong. It took a while. There are no official records of Odin from after the war, but much was written about (and by) him. Records of his wife end around the same time, as does a curious string of missing-persons cases. Laslow vanished after the war, but he inspired generations of dancers and rallied the spirits of many. Records of his wife end around the same time, as does a curious string of missing-persons cases. Benny was assigned to train new soldiers but soon retired to live in the forest with his animal friends. Peri eventually learned the difference between right and wrong. It took a while. As King of Nohr, Xander laid the foundation for a new era of peace and prosperity for the kingdom. Peri eventually learned the difference between right and wrong. It took a while. — Peri, as an enemy in Birthright Chapter 12. “ Peri: Ooh! I found you, you little traitor! Corrin: I am not a traitor! King Garon is a tyrant! And who are you, anyway? Peri: Not a traitor? But Lord Xander said you were... I'm Peri! No offense, but I'm going to kill you now. — Peri, fighting Corrin as an enemy in Birthright Chapter 12. — Peri, as an enemy in Birthright Chapter 26. — Peri, as an enemy in Revelation Chapter 13. — Peri, performing a Dual Strike. — Peri, performing a Dual Guard. — Peri, after defeating an enemy. — Peri, if her partner defeated an enemy. — Peri, when one or no stats grow in a Level Up. — Peri, when two or three stats grow in a Level Up. — Peri, when four or five stats grow in a Level Up. — Peri, when six or more stats grow in a Level Up. — Peri's defeat voice clip. — Peri's defeat quote in Birthright Chapter 12. — Peri's death quote in Birthright Chapter 26. — Peri's defeat quote in Revelation Chapter 13. Peri is currently featured on four cards in Fire Emblem Cipher. All I know is Blood! : [Trigger] Until the end of the turn, this unit’s attack is increased by 10 for each unit destroyed. Xander’s Retainer: [Trigger] When this unit attacks, if you have a “Xander” on your field, this unit gains 10 power until the end of the battle. Attack Emblem: [Support] Until the end of the battle, your attacking unit gains 20 attack. "I'm Peri, and I love to fight! Every one of our enemies will make for a splendid meat lump!" That won’t save you! : [Activate] [Once per turn] [Destroy one of your other allied units] This unit gains 30 attack until the end of the turn. I want to kill more! : [Activate] [Once per turn] [Destroy one of your other allied units] This unit’s range becomes 1-2 until the end of the turn. Peri wants to return the favor too! : [Trigger] When this unit is defeated by a unit in the opponent’s Rear Guard, destroy that attacking unit. For more detailed strategic information on these cards, see their TCG wiki article on Peri . Viewing Peri's face in the Accessory Shop. In her Private Quarters graphics Peri has complete heterochromia like Idunn and Ranulf. Peri's visible eye is pink, and the eye under her bangs is green. 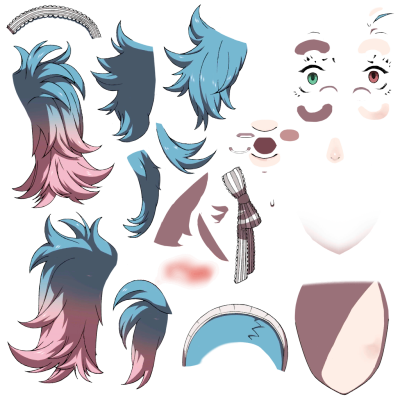 However, Peri's 3D model has two pink eyes. English Peri A variation of her Japanese name. Japanese ピエリ Officially romanized as Pieri. Artwork of Peri from Heroes.